How Does Practicing with a Golf Simulator Improve Your Game? As the popular saying goes…”practice makes perfect”, but what should you practice in order to improve your golf game? When it comes to a golf swing, there is a lot to remember. A golf simulator can help you find your groove and perfect your game. Golf simulators are not only a great way to conquer the boredom of just hitting balls into a net, but with the right simulator, you’ll have fun while improving your game without even realizing it! Swing Zone Golf features GOLFZON simulators are the official golf simulator of the LPGA. Whether you consider yourself an amateur or a pro, these realistic simulators allow you to enjoy a complete golfing experience which highlights some of the world’s most famous courses including Pebble Beach and PGA National. So, why should you choose an indoor golf simulator? GOLFZON simulators feature the most advanced simulator technology in the industry and include various training modes; custom settings for play conditions including location, wind, weather, and tee height; and a moving swing platform that provides bunker, rough, and fairway hitting surfaces as well as a directional tilt to create uphill, downhill, and sidehill lies. One of the most useful aspects of golf simulators is the instant feedback and sophisticated swing analysis you can receive, including swing speed, face angle, launch angle, spin, and distance. With GOLFZON’s T1 Sensor technology, you can trace the club movement, the impact on the ball, and the ball movement precisely and accurately. With this data, you can learn setup and swing changes to truly improve your game. It’s no secret that weather can have a huge impact on your game. It’s imperative to train for the various weather conditions you may encounter. Golf simulators, such as GOLFZON are great at replicating difficult weather conditions so you’ll be prepared for any known condition. This will help you perfect your swing and your golf game even during the harshest winters. Swing Zone Golf’s GOLFZON simulator provides the most realistic golfing experience. Its technology allows golfers to practice every type of shot and train on various aspects of their game. With its multi-surface hitting mats, moving swing plates, and various hi-tech sensors, this simulator offers golfers an unmatched realistic simulation that provides a real-play experience. A golf simulator can not only improve your mechanics, it can make you mentally stronger. Using the data analysis provided by your simulator, you can perfect your swing, learn to select the correct club, shape your shots, thus improving your skills, abilities, and consistency. 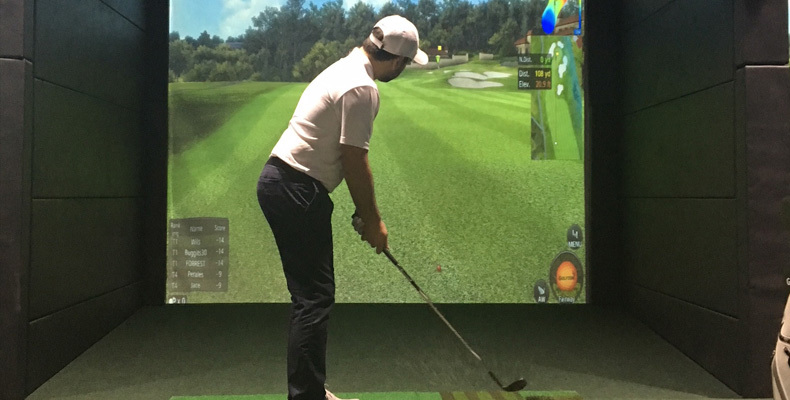 One of the greatest features of practicing with the golf simulator at Swing Zone Golf is the digital video of your swing that can be streamed to your smartphone. This allows you to review and analyze your swing to share with your friends or track your progress. Just another reason to choose Swing Zone Golf! !